NEIGRIHMS Recruitment 2018 2019 Application Form for 107 Senior Resident, Junior Resident, Anaesthesiology, General Medicine, Obstetrics & Gynaecology, Paediatrics, Radiodiagnosis Posts Download Application through Official website www.neigrihms.gov.in. NEIGRIHMS Senior Resident, Junior Resident Jobs Notification 2018 Released. 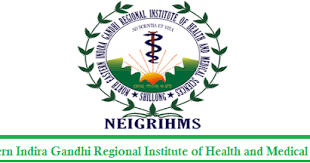 NEIGRIHMS invites Walk in Interview for appointment in following Senior Resident, Junior Resident post in North Eastern Indira Gandhi Regional Institute of Health & Medical Sciences. Candidates are requested to Download Application through Official website www.neigrihms.gov.in. Prospective candidates will have to before Walk in Interview carefully reading the advertisement regarding the process of examinations and interview, eligibility criteria, Offline registration processes, payment of prescribed application fee/intimation charges, NEIGRIHMS pattern of examination, NEIGRIHMS Syllabus, NEIGRIHMS Question Paper, NEIGRIHMS Walk in Date, NEIGRIHMS Result Date etc. i. Postgraduate degree or diploma in respective subject recognized by MCI after obtaining a medical qualification included in the Schedule - I & II of the 3rd Schedule of Indian Medical Council Act 1956 (persons possessing qualifications included in the part - II of the 3rd schedule should also fulfill the conditions specified in section 13 (B) of the Act). i. Medical qualification included in the Schedule - I & II of the 3rd Schedule of the Indian Medical Council Act 1956 (persons possessing qualifications included in the part - II of the 3 rd schedule should also fulfill the conditions specified in section 13 (B) of the Act). ii. Satisfactory completion of the compulsory internship.